Categories: Nea, Puzzles, Nea Puzzle. 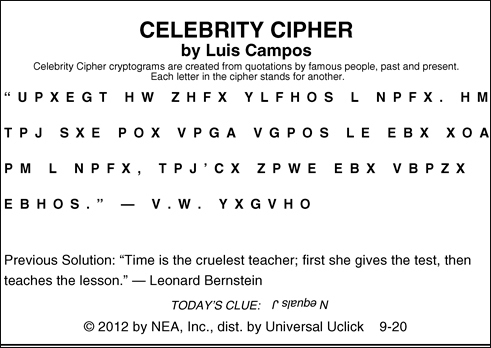 In Celebrity Cipher, readers must decode quotes from well-known past and present individuals, living or deceased, covering all spectrums. Dominican-born Luís Campos is a prize-winning poet and patented inventor. He has published more than 14,000 cryptograms and crossword puzzles -- in English and in Spanish -- since 1984.